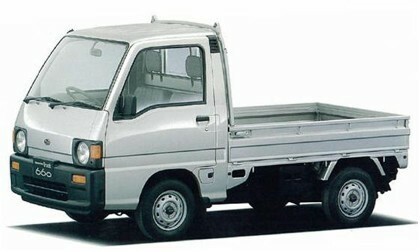 Popular mini truck models include the Suzuki Carry, Daihatsu (Toyota) Hijet, Honda Acty, Subaru Sambar, Mitsubishi Minicab, Nissan (Mitsubishi) Clipper and Mazda (Suzuki) Scrum. All models offer high-quality Japanese design and peppy performance for trails and transportation around town. But each model has its own special characteristics as presented in the following short descriptions of four major models. See our comparison tables for more details. 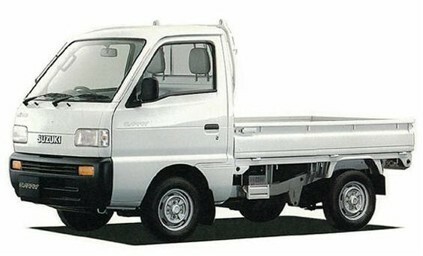 The Suzuki Carry is by far the most popular mini truck in Japan and you can easily find secondhand models in pristine condition. It also has the best parts support in the United States, partly because so many of its components are shared with later-model Carrys and other Suzuki vehicles like the Jimny. Lightweight and durable, the Carry is great for off-road work. 4WD is available at all speeds, letting you haul loads and travel fast over rough terrain. The highly reliable engine is centrally mounted beneath the front seats with a transmission geared low for hauling. The Sambar engine is mounted just behind the rear axle, making the ride quieter and less tiring than in models with engines mounted under the seats. This explains why a major delivery company in Japan exclusively uses Sambars. The rear-heavy design is slightly noticed when cornering fast on wet or snowy roads, but the four-wheel independent suspension helps keep everything under control. The rear engine also contributes to solid off-road traction. When the going gets rough and you enter first gear, 550cc models conveniently enter 4WD mode without the need to press a button. They switch back to 2WD when you enter second gear. The Honda Acty is quiet and comfortable to drive. It supplies more power than other mini trucks when traveling uphill at high speed thanks to basically the same reliable engine powering the Honda Beat sports car and Honda Today. As in the Sambar, a rear-mounted engine (just in front of the rear axle) contributes to a quieter ride, less cabin heat in the summer, higher stability when carrying heavy loads and very slight oversteer when cornering fast on roads covered with gravel, rain or snow. Parts from 660cc models are often compatible with 550cc models. 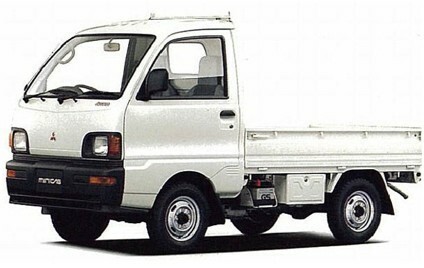 The Daihatsu Hijet is comfortable, durable and perfect for hauling loads. In comparison with the Suzuki Carry, it offers slightly more legroom in early to mid-1990s models and a higher sense of luxury overall. But the Hijet also tends to cost a little more. Its three-cylinder water-cooled engine is mounted beneath the front seats and delivers excellent acceleration. 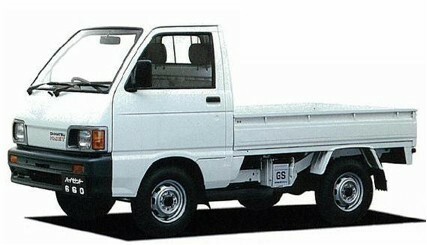 Hijet parts are easier to find in the United States than parts for any mini truck except the Suzuki Carry. Dump truck models are available. The Mitsubishi Minicab came came into its own from the mid 80’s. Angular headlights became the defining feature of the Minicab’s styling, along with larger windows to improve visibility. A rear wiper, electronic locking rear gate and power brakes were adopted. Mitsubishi began to offer a wide variety of both FW and 4WD model variations. The next generation Minicab incorporated many class-leading features such as an automatic free wheel hubs adopted on all four-wheel drive models. The estate models featured the first sliding sunroof in their class. 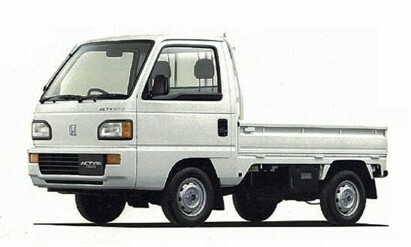 Mitsubishi also became the first manufacturer to offer a supercharged kei truck.